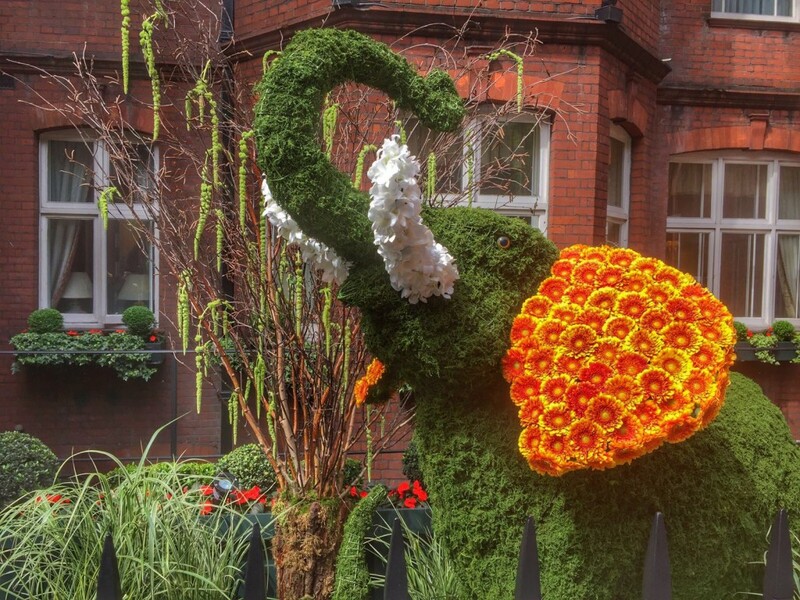 The world-class alternative floral art show ‘Chelsea in Bloom’ was back this year for its 12th Anniversary. 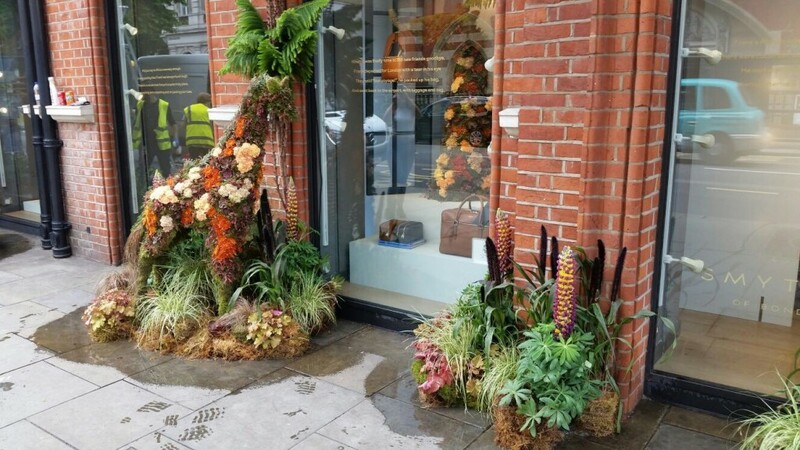 Produced in association with the Royal Horticultural Society (RHS), it transformed the local streets in May when the area’s best retailers, restaurants and hotels adorned their buildings with breathtaking floral displays and competed for the show’s coveted awards. This year’s theme ‘Floral Safari’ inspired the retailers to explore the creative design potential of exotic animals, savannahs, plains and jungles. Each entrant turned to experts for help and Agrumi was on hand to ensure that two entrants won big. This private members club on Lower Sloane Street is lucky enough to have an in-house florist – Carter Cherrill. Carter designed the Club’s display to highlight the plight of the African elephant – a majestic animal that is being hunted to extinction. 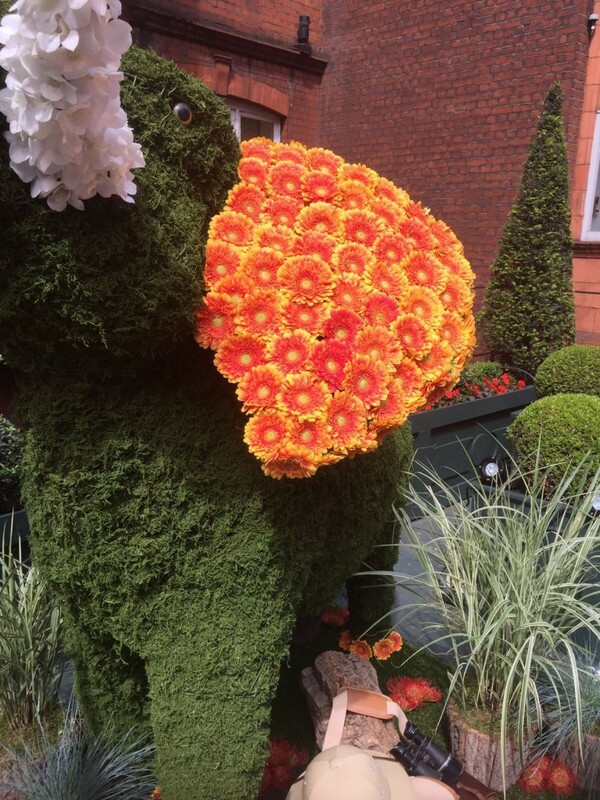 The intention was to use the publicity garnered from the prestigious ‘Chelsea in Bloom’ event to focus attention on this serious ecological issue. 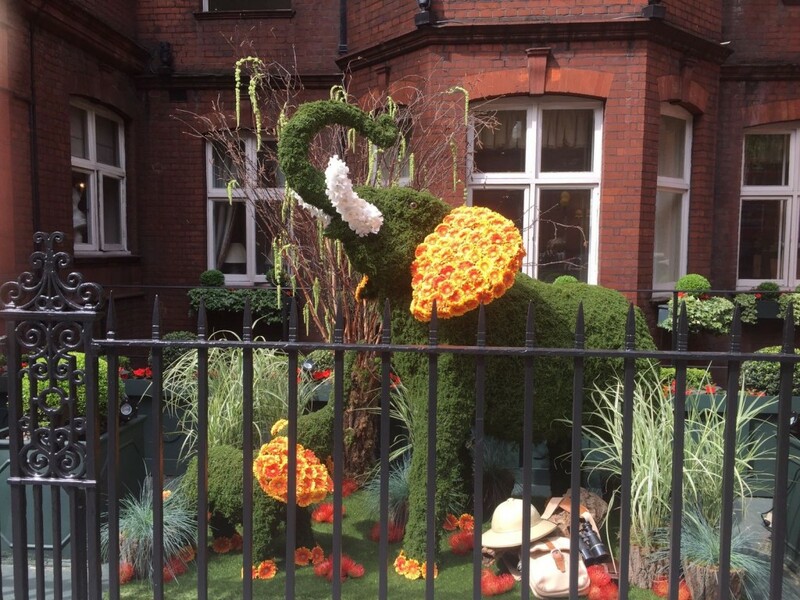 Agrumi was asked to create a 2-metre long topiary female African elephant in typical pose – trunk held high protecting its child. There are key physiological differences between African and Indian elephants and it would have been a serious mistake for Agrumi to misrepresent them. Carter and Agrumi complemented the beauty of the wild beasts with natural planting. The hard work and attention to detail paid off and the RHS judges awarded the display a silver medal. 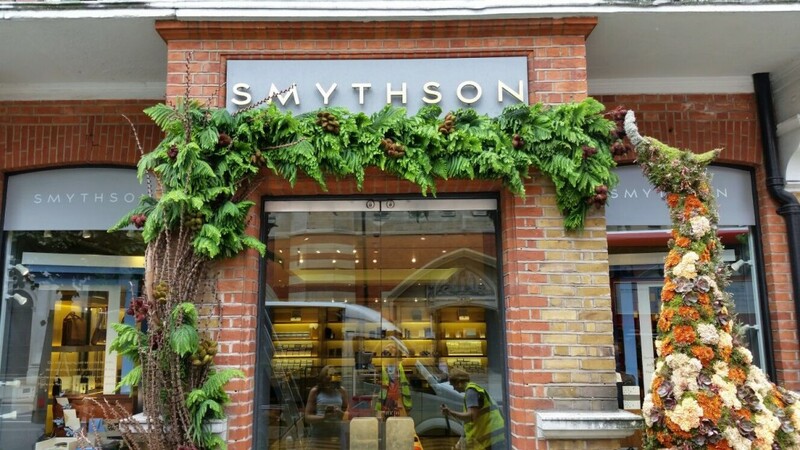 Smythson, the Sloane Street-based luxury leather goods retailer, brought florist Amanda Willgrave on board to design their display. She in turn commissioned Agrumi to bring her design vision into reality. Honouring Smythson’s 125 year-old archive, Amanda wanted to tell a story based on the golden age of travel. The resulting window treatment transported visitors to the African Savannah and the world-famous Giraffe Manor in Kenya. 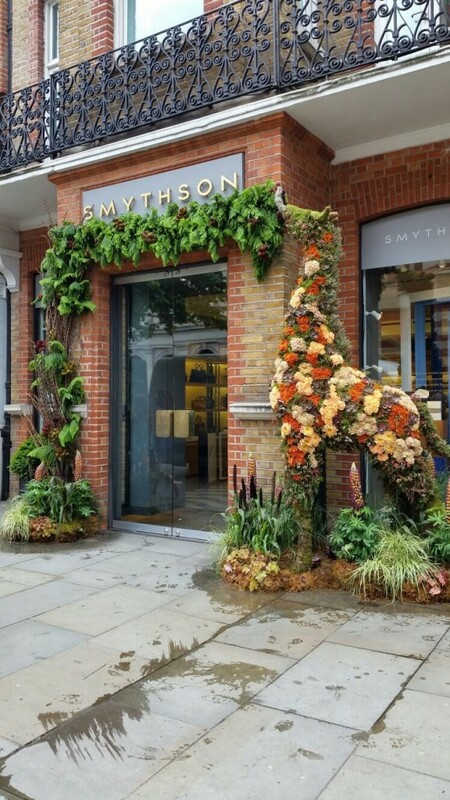 Life-sized mother and baby topiary giraffes, designed and made by Agrumi, flanked the entrances to Smythson’s boutique and welcomed guests into the store. The animals were surrounded by acacia and moss planting complemented with an array of indigenous African foliage and plants. Agrumi also made a separate giraffe head as a focal point for an interior display. Amanda’s design and Agrumi’s execution of her vision enchanted the public and judges alike and it was awarded 2nd place and ‘highly commended’.